When a polarized plane wave is incident upon an ideal spherical cloak, the object behind the cloak is completely hidden, as shown in this figure (wave arrows from behind pass through the cloak to appear in front). Credit: Chen, et al. ©2007 PRL. Is a perfect invisible cloak theoretically possible? Are there certain wavelengths—such as those in the visible spectrum—that can’t be made invisible? How will using imperfect materials affect the performance of a cloak? Scientists from Zhejiang University and MIT have recently analyzed the physics behind invisibility cloaks in an attempt to answer some of these questions. Hongsheng Chen, Bae-Ian Wu, Baile Zhang, and Jin Au Kong have published their research on invisibility cloaks in a recent issue of Physical Review Letters. The group analytically demonstrated how electromagnetic waves interact with invisibility cloaks made of metamaterials, an interaction that is often different from conventional scattering with regular particles. Their findings will hopefully be useful for cloak design and applications, an exciting research area that is still in its early stages. Citation: Chen, Hongsheng, Wu, Bae-Ian, Zhang, Baile, and Kong, Jin Au. 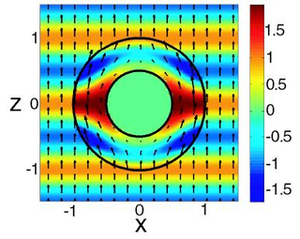 “Electromagnetic Wave Interactions with a Metamaterial Cloak.” Physical Review Letters 99, 063903 (2007).